Whether you’re embarking on a long trip by car, taking a flight to an exotic destination, experiencing a fun ocean voyage or simply enjoying a sunny day at the beach, an unexpected problem in your mouth can become a major dilemma. What happens if you break or chip a tooth, lose a filling, or begin to suffer from the pain of a never-ending toothache, and you have no immediate access to your regular dentist? There are a few things – temporary solutions – that you could do immediately to address the problem and help ease the pain, at least until you return home. Toothaches. Rinse mouth with warm water and use dental floss to remove any lodged food. If swelling appears, hold a cold compress to the outside of the mouth or cheek. Never put aspirin against the gums or on the sore tooth, because it may burn the gum tissue. Chipped or Broken Tooth. Rinse mouth and any broken pieces with warm water. If bleeding, apply a piece of gauze to the area for about 10 minutes or until the bleeding stops. Hold a cold compress to the outside of the mouth to reduce swelling and ease pain. Lost Filling. Stick a piece of sugarless gum into the cavity (sugar-filled gum will cause pain) or use an over-the-counter dental cement. Lost Crown. If in pain, use a cotton swab to apply a little clove oil to the tooth. Try to slip the crown back over the tooth. Before putting the crown back in place, coat the inner surface with an over-the-counter dental cement, toothpaste or denture adhesive to help hold it in place. Never use super glue! Broken Braces Wire. If a wire breaks or sticks out and is poking you, use the eraser end of a pencil to move the wire. If that is not working, use orthodontic wax, a small cotton ball or a piece of gauze to cover the wire tip. Don’t cut the wire, because there’s a risk of swallowing it. Knocked-out Tooth. Retrieve the tooth, hold it by the crown (the part that is usually exposed in the mouth) and rinse with warm water. Using no force, try to replace the tooth facing the right way. If that’s not possible, put the tooth in a small container of milk (or a cup of water that contains a pinch of table salt). A tooth that has been knocked out has the highest chance of being saved when it is returned to the socket within one hour. These tips can help get you through an emergency, but it’s important to see a dentist when you return home. 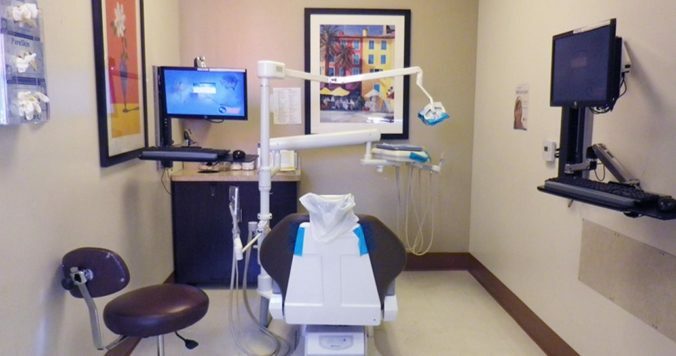 To learn more about Western Dental or inquire about an office in your community, visitwww.westerndental.com.